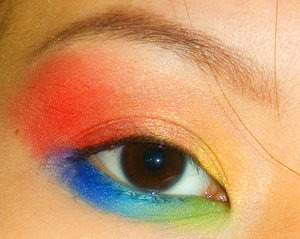 When you are feeling blue.. and everything seems gloomy and dark.. brighten up your day with colourful makeup! 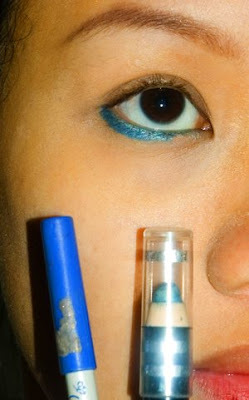 Line your wet lower lash line with cyan eyeliner. 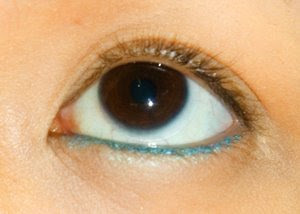 That’s the cyan eyeliner I used.. so fat and thick I know!!! 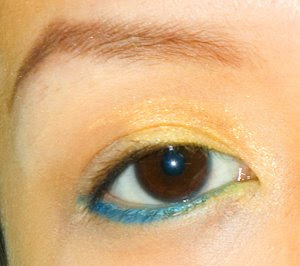 And line the outer corner of your lower lash line with the dark blue eyeliner. 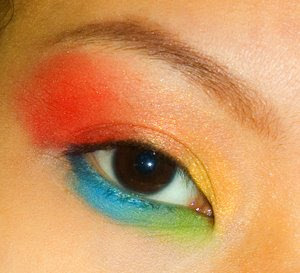 Take yellow and apply on the inner corner of your eye. 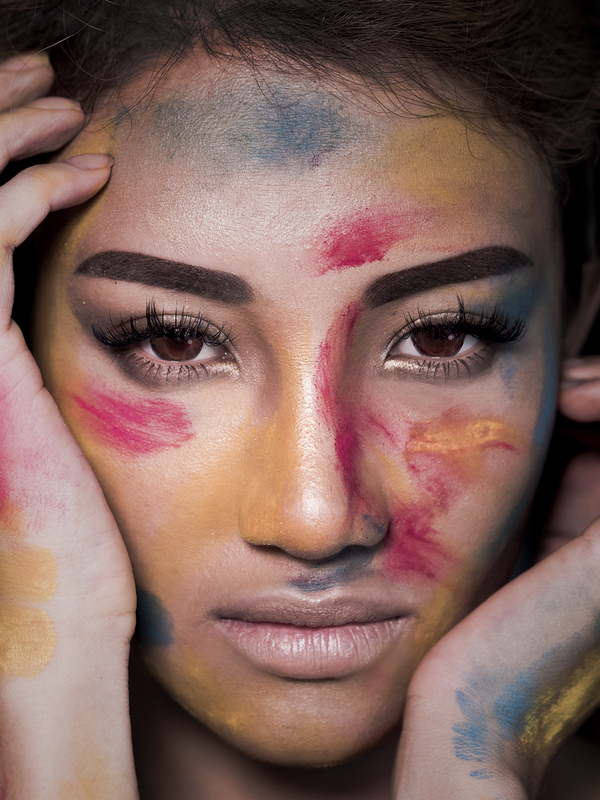 You need to do the wet application cuz Yellow pigments do not show up well on our skin. Just wet your brush before you pick up the color. I use shade 13 for this step! 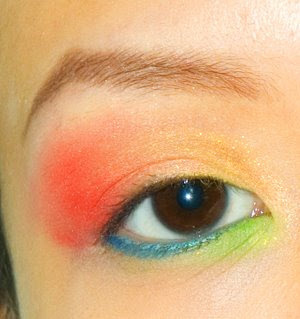 Fill the red of your lids right up to the brow bone with orange. I used shade 42. Remember to blend over the yellow! Vermillon Red or Orange for this step is recommended. 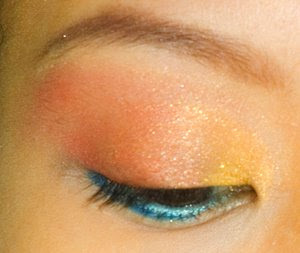 Try not to use reds that are tinted with blue..for example Shade 75 from the pigment pallete. You should use shade 53 instead. 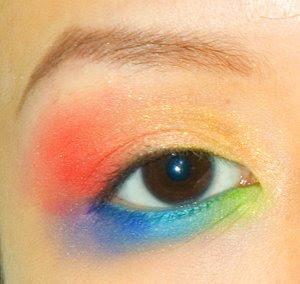 Apply on the outer corner of your eye and blend up! Clean your brush as we are moving to the application of cool colours now! Use a yellowish green for this step, I use shade 47 and apply on the inner corner of my lower lashline. Take an Aqua Blue for the middle section of your lower lashline. I use Shade 71 from the pigment pallete.. Remember to blend well! You can use any dark blue colour for this step. I use 2 shades by dabbing my brush on Shade 83 and 72 before applying on the outer corner of my lower lashline! The final colour is a soft purple colour. Use this colour to blend the dark blue and the red together! I used shade 41. I line my upper lashline with liquid eyeliner! 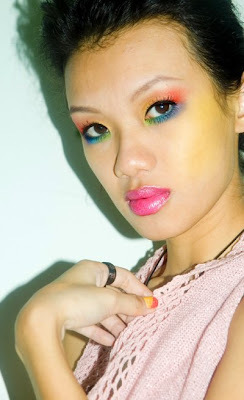 For your blusher, you can try using yellow if you are adventurous.. You can use bright fuschia pink for your lips! You can always reverse the colours… Right now it is hot colours on top and cool colours at the bottom but you can switch them! 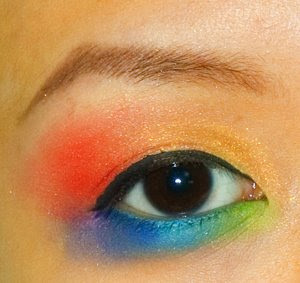 For night makeup.. you can smudge your eyeliner to blend a little on to your colours! Remember to wash and clean your brush often when applying this makeup as your brush will get quite dirty from all the many colours! I love the upper shades a lot! While the lower shades I think it makes the rainbow look mysterious, and it tunes down the cheery mood a little! But… it’s still nice!